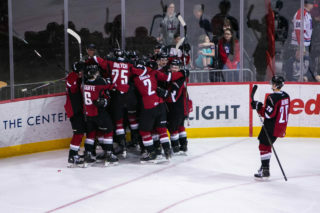 This afternoon in Langley the Vancouver Giants and Prince George Cougars meet for the back-half of their Saturday-Sunday double-header. Last night the Giants held on to earn the 2-1 victory on the strength of 32 saves from Trent Miner and second period goals from Tyler Ho and Cyle McNabb. 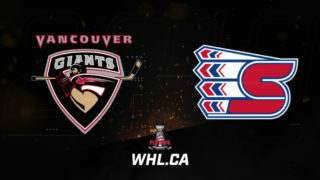 The Giants have won three straight games and come into action today two points ahead of Everett for first in the West and eight points up on Victoria for first in the B.C. Division. The Prince George Cougars come into this afternoon’s game with the 22nd ranked power play in the WHL. The power play went zero-for-three in last night’s contest and over the course of three games against the Giants this season, the power play has gone one-for-12. That said, the power play has gone five-for-19 over the past four games, including a 2/3 power play back on October 30th against the Brandon Wheat Kings. Last night Taylor Gauthier made 27 saves in a 2-1 loss at the hands of the Giants. He was the fourth highest goaltender ever selected in a WHL Bantam Draft. The 2001-born product of Calgary, AB was selected ninth overall by the Prince George Cougars in the 2016 WHL Bantam Draft. So far the 17-year-old has put together a 5-6-1-1 record with a 2.84 goals-against-average and a .910 save percentage. He earned his first career WHL shutout last week against Seattle. This summer Gauthier earned a gold medal alongside Giants d-man Bowen Byram with Team Canada at the 2018 Hlinka Gretzky Cup. Gauthier was ranked as a ‘B’ prospect on NHL Central Scouting’s Preliminary Players to Watch List last month. He and Trent Miner were the first two goaltenders selected in the 2016 WHL Bantam Draft. 1999-born forward Vladislav Mikhalchuk comes into this afternoon’s game as the leading scorer for the Cougars. His three goals and 10 assists give him 13 points on the season. Though he’s gone pointless in his last two games, Mikhalchuk has notched two goals and five assists for seven points over the course of his last five games. Last season the Belarus-born forward had 14 goals and 19 assists for 33 points in 60 games. 2001-born goaltender Trent Miner continues to impress during his first full WHL campaign. The product of Winnipeg, MB sits at the very top of the WHL in goals-against-average (1.35), save percentage (.955) and has put together a record of 5-0-1-0 through seven appearances. 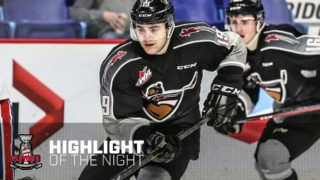 Last night, Miner was named the game’s first star as the Giants earned a 2-1 victory over the Prince George Cougars. Miner made 32 saves, 17 of which came in the third period as the Giants held on to secure their 13th win of the season. Twice in October Miner was named WHL Goaltender of the Week. 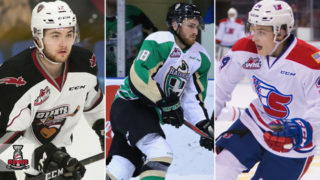 Earlier this season he was given a ‘C’ ranking on NHL Central Scouting’s Preliminary Players to Watch List ahead of the 2019 NHL Draft. He was selected 20th overall by the Giants in 2016. The Giants got offensive help last night from 2000-born forwards Tyler Ho and Cyle McNabb. Tyler Ho tied the game with a goal at 11:44 of the second period marking his first goal since October 6th, 2017. Then, a few minutes later Cyle McNabb found the back of the net for the first time since October 7th, 2017. That goal stood as the game-winner. Evan Patrician registered his first WHL point with an assist on Tyler Ho’s goal. ONE GOAL GAMES? NO PROBLEM! 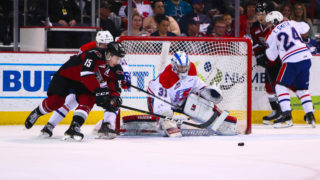 The Vancouver Giants have appeared in nine one-goal games so far this season. Their record in those games: 7-0-2-0. The Giants have played three one-goal games in a row and four of their last six games altogether have been decided by a single goal. On the other side of the coin, the Cougars have also played in nine one-goal games but have compiled a record of 3-3-1-2.